Rain did not deter today's ANZAC marchers as they mustered at the waterfront end of McMasters road at Blackwall , by rough estimate I figure there was close to 50 or 60 lads there. 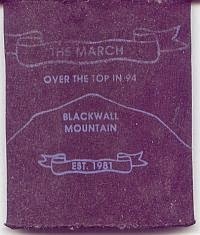 This long time tradition started back in 1981 with myself and our band of mates who thought it would be fun to rough it straight over the top of Blackwall Mountain en route to Ettalong Pub for the two up games from a mates house along the waterfront at Blackwall. For years there was our little band of mates always around 10 to 15 of us gathering to catch up but this began to dwindle as some of us moved away from town , a couple of years there was just a handful of us. We often talked about how it would be great to establish some sort of local tradition that would perpetuate over time , I don't think any of us could see what would happen in the future. 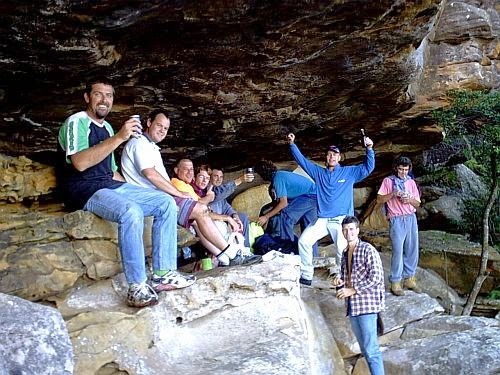 Things began to change in the last 15 years or so , mates began bringing their younger brothers and people from outside of our circle , and those brothers brang their mates. The numbers started to rise , year after year now , the local footy and AFL teams began to turn up and our little band of original brothers became outnumbered by a new generation of locals. From those humble beginnings the head count at some recent marches has reached the 100 mark at peak , all by word of mouth. 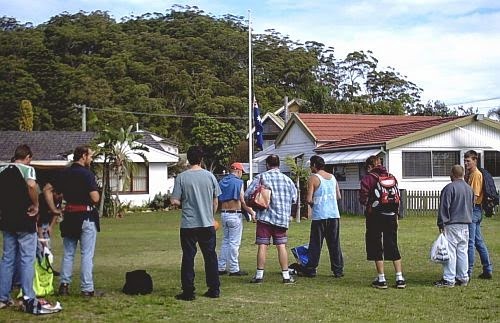 What started as a beer soaked bush bash by some mates 34 years ago has become something that I am proud of having a part in , while not being an official ANZAC memorial of any sort we do pay our respects yearly at a raised flag in the front yard some long suffering persons house along the waterfront at Blackwall. I think I recall we spoke to them once and they were puzzled for years as to who we actually were , but they did say that they now raise it specially for us. What we do celebrate is the most important value of being an ANZAC and that is mateship , year after year we have met there to catch up with long lost friends , some of those guys have passed away which makes the next march that little bit more important. I teared up today as I saw all the young blokes getting ready for the hill climb , a quick word was spoken by our long time march leader Tony about the origins of the march and respects were paid to a dear mate who passed away just before Christmas last year , his son and wife were there in the crowd. Brilliant. What a great story. spewing I missed it this year. I think the last one I went on was about 20yrs ago. Jack was 3yrs old.